Looking for the unprecedented "Cabin in the Woods" property? You may find just that in the Quandary Village AKA NorthStar Village neighborhood. Just 12 to 15 miles outside Breckenridge to the south and up Hoosier Pass. Spectacular views of the valley below and of course, home to the only 14,000.00 foot peak in Summit County, Quandary Mountain. 360 total home sites are found in Quandary Village. Most of them over 11,000,00 feet in elevation. 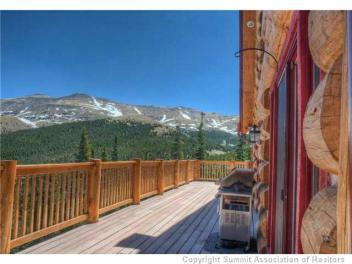 These properties are certainly high on the mountain and represent some of the best values in the single family home market in Breckenridge. All properties require a valid building permit and plans, approved septic system and soil reports, surveys and topographical maps. Quandary Village is located approximately 12 miles south of the downtown Breckenridge, and at an altitude of over 11,200 feet. Drive is approximately 11 miles, 23 minutes, weather permitting.